Habit: Grimmeodendron eglandulosum grows as a large shrub to small tree up to 8 m in height. The leaves are arranged alternately, up to 10 cm in length, up 3 cm in width and have 2 glands at the leaf base. The leaf margin serrulate with hooked spines arising from the teeth. Stems and leaves produce a milky sap. Grimmeodendron eglandulosum is monoecious with the flowers are arranged in terminal spikes. The flowers have 3 sepals in the calyx, are a yellowish-green, and are subtended by a large bract.. The staminate flowers have 3 stamens and occur in groups of 1-4 flowers. The carpellate flowers occur in groups of 2-3 with each having a superior ovary that has three locules. The fruit is a 3-lobed capsule that spits apart into 6 sections. The seeds are brown with dark lines. Habitat: Grimmeodendron eglandulosum grows primarily in Dry Broadleaf Evergreen Formations – Forests/Shrublands (coppice) as well as Pine Woodlands. 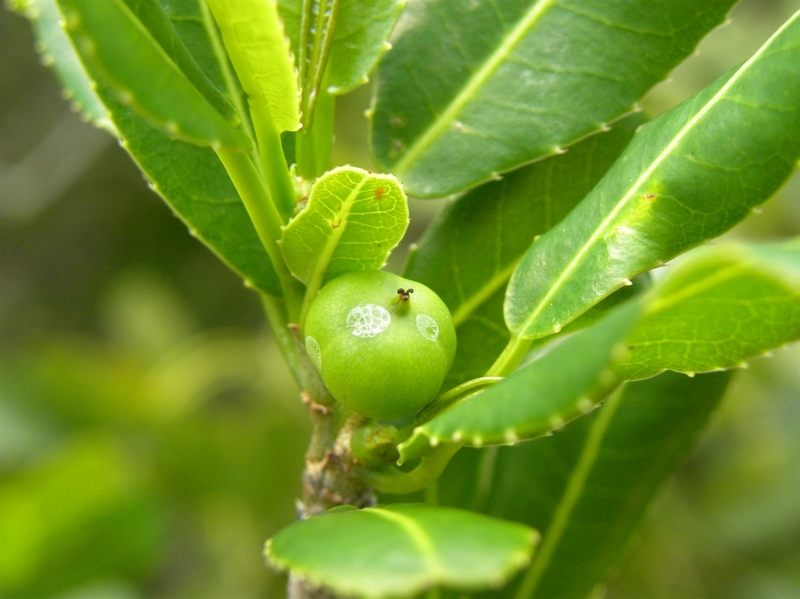 Distribution in Bahamas/Globally: Grimmeodendron eglandulosum occurs in the central and northern Bahamas as well as Cuba. Medicinal/Cultural/Economic usage: Grimmeodendron eglandulosum has no known medicinal usage in the Bahamian Archipelago. All parts of Grimmeodendron eglandulosum are considered poisonous!! Contact with Grimmeodendron eglandulosum should be avoided at all costs as the sap can cause extreme dermatitis.